Get clean with shower trailers for rent, anywhere in the U.S.A.
VIP To Go shower trailers for rent come in many varieties that we can deliver right away to meet your needs. Whether you are having an outdoor event where people are likely to get dirty or need to provide for decontamination after a long day of work, VIP To Go has you covered. Depending on your needs you may have considered actually buying a shower unit. Well, we’ve looked into that for you. Yes, there are certainly many options, from a simply shower that attaches to your hose and sprays you with cold water for $300 to an inflatable stall unit with transparent plastic and no heater which sells for over $8,000 and on up. Of course, buying your own lighted, private shower trailer can cost you upwards of $60,000. There certainly are options. So, if money is no object, perhaps your own trailer is the way to go. But if you have a budget and want something more than a romp through a garden hose, then a shower trailer rental from VIP To Go is probably a good option to pursue. 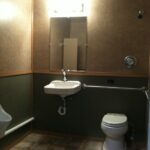 VIP To Go carries a wide selection of shower trailers for rent. In fact, while most restroom rental companies do not even carry shower trailers, we have shower and toilet combo units, multi-shower units and more, all with electric lights, heated water and large water holding tanks. From wedding camp-outs to decon, scout outings to oil rigs, we have the shower that you need. With a shower trailer you can provide facilities for your guests or workers to clean up after a grueling event, rinse off after or escape from unexpected weather, and in short continue to enjoy your event clean and relaxed after a nice warm shower. At VIP To Go our trailer showers prices include everything, from preparation to delivery, set-up to pick-up. All you have to provide is a space to place the trailer, and we will even help with that, doing a free site walk through in advance to help you choose the perfect location for your portable shower trailer. If you have a basic 110 volt, properly grounded outlet and a garden hose, then you have all that we need to hook up your hot and cold running water. If not, then we can provide a generator and filled water tanks to keep your shower running. Call VIP To Go today and one of our experienced customer service representatives will ask you about your needs and then send you a customized quote, complete with images of our shower trailers, and help you solidify your plans fast. The Vegas 15’ trailer bathroom has 5 stations: A women’s room with 2 stalls and a sink and a men’s room with 1 stall, 2 urinals and a sink. There is AC, music and more. Do you know how many toilets you need? Or what to do if you don’t have an electrical outlet nearby? Test your portable bathroom trailers knowledge! If you require a shower trailer for short term or long term use you may find that shower trailers can be difficult commodities to find, but a necessity when the need strikes. 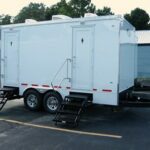 Shower trailers aren’t as commonly available as restroom trailers are, as they simply aren’t as big of a business. But that doesn’t matter to you or your organization when you need a shower trailer. That’s why VIP To Go has made shower trailers an important part of our offerings to our customers. We carry a variety of shower trailers to meet your short term and long term needs. In fact, our commitment to your needs and satisfaction really shine through in this area, as we offer exceptional service and even customization.